9/24/2017–LOUISBURG, NC–On Saturday, 9 September 2017, the North Carolina Wing flew its 1,000th glider sortie from the NC Wing Glider Base at the Triangle North Executive Airport. 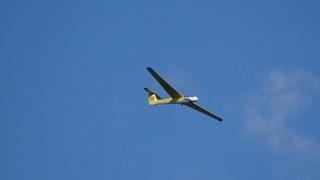 This glider flight marked a major milestone achieved by the NCWG’s glider program in just over four years. The lucky cadet on the historic flight was C/A1C Sarah Haynes of NC-162. It was Cadet Haynes’ very first glider flight and she was excited about the flight. Cadet Haynes noted that she especially loved doing stalls and 2G turns in the glider. She plans a career as a commercial airline pilot, has completed Ground School and is working on setting up flight training. She is planning to attend the 2018 CAP Glider Academy and hopes to get her private pilot’s license while in CAP. The glider pilot for the 1,000th flight was Capt John Styers and the tow pilot was Lt Col Rich Netherby, both from NC-145. The Air Boss was 1st Lt Steve Risoff of NC-048 and Capt Dave Stange was the NC Wing Glider Orientation Flight Coordinator. Cadet Wing Runners for the flight were from NC-145, NC-162, NC-305 and NC-052. The large glider flight team on September 9th also included glider pilot Maj Ricky Jones and tow pilot Lt Col Dion Viventi, both of whom flew numerous O-flights that day. The NCWG’s glider first arrived on 27 April 2013, culminating nearly a year of effort and training. The glider came from the U.S. Air Force Academy in Colorado Springs, CO, and was one of two gliders assigned to MER from the USAF. A multi-person team from NC, VA and MER worked together to get N437BA to NC that day from VA. Col Larry Ragland flew the tow plane and 1st Lt (now Maj) Ricky Jones from NC-079 flew the glider as it was aero-towed from Danville, VA to the Triangle North Executive Airport in Louisburg, NC. Col David Crawford, Lt Col Dion Viventi, Major (now Lt Col) Rob Mason, Capt (now Lt Col) Rich Netherby, Capt Steve Merritt and 2nd Lt Calvin Mayo worked on recovering the glider and tying it down. Major (now Col) R. Jason Bailey towed the trailer from Danville to Louisburg, completing the package transfer. The glider landed safely at the Triangle North Executive Airport that morning and has been in constant use ever since. Col. Crawford noted that the TG-10B "Merlin" glider is commercially known as the L-23 Super Blanik. The NC Wing’s glider program started with 2 Wing tow pilots (plus Col Ragland, MER Commander), 2 glider pilots, a glider operations coordinator (Air Boss) and a fully trained and qualified ground operations team. Maj Ricky Jones was the NCWG's first Form 5'd glider pilot. The VAWG supported the NCWG in 9 months of glider training and helped the NCWG jump start its glider program with a fully qualified cadre of personnel. Capt Steve Merritt, the NCWG’s CFIG (Certified Flight Instructor – Glider) and the KLHZ airport manager, was instrumental in the support and success of the glider program from the beginning. The Franklin County Composite Squadron (NC-145) also supported the glider program since 2013 and is the backbone of the Wing’s Glider Ops today. In 2013, Col Ragland said, “With four operational gliders in MER, we should all be excited about the future of our collective glider programs. We hope to see many more of our cadets getting up and soaring high across all boundaries and beyond all limits.” Col Ragland’s prediction has certainly come true for the NCWG.